KS Audio / KS Digital has successfully developed a listening standard in loudspeaker design that guarantees the reproduction performance for each loudspeaker unit (fitted with FIRTEC) for the stage and studio production environments. The standard is FIRTEC DSP control technology and it is exclusive only to KS Audio. The KS Audio standard is unique, and the first to create a standard of determinate quality of audio performance, whereby the loudspeaker faithfully reproduces the input signal in a finite and predictable way that can be measured, stored and replicated uniformly into each of the KS Audio DSP loudspeaker units for studio and stage equally. The KS Audio FIRTEC program digitally corrects and matches up the performance of the loudspeaker to the input signal, and in doing so, all effects of distortion, artificial imaging, colorations and other unwanted resonances that are the expected natural and normal by-products of transferring electrical energy out to atmospheric pressure via the exertion of a mass are removed. Therefore, the sound of the whole unit remains invisible to the listener, exposing only the original input signal for the first time. The listener is closer to the original performance than ever before, experiencing clear and accurate audio with little or no auditory fatigue. Expertly engineered sound productions are only fully realized and experienced when replayed on KS Audio DSP studio and mastering reference monitors, or on stage with selected digital concert PA loudspeaker systems. KS Audio has successfully applied this technology in numerous installations such as various German Opera and Play Houses and the Reichstag (Congress) in Berlin as well as in recording and broadcast studios across the world. For 28 years, FIRTEC DSP technology has been the express aim of KS Audio in Germany. It is currently available in several KS Audio products, both in self-powered and in un-powered systems. FIRTEC DSP technology is a unique product innovation that separates KS Audio from all other manufacturers. 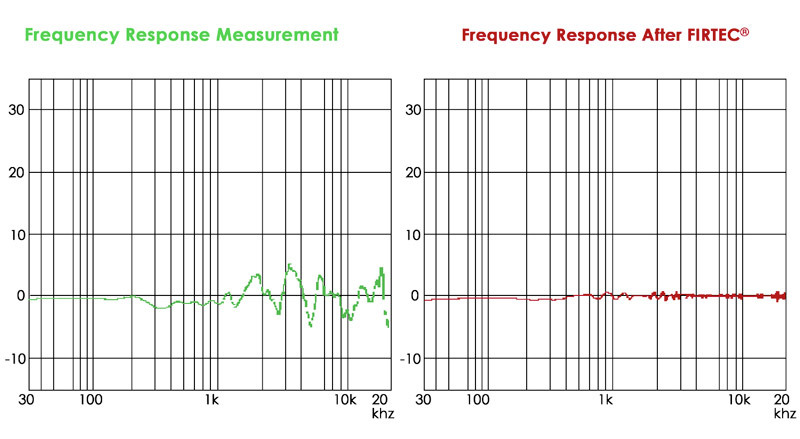 The application of Finite Impulse Response (FIR) is well known in the field of acoustic measurement. However, KS Audio has broken the chains that have locked out the availability of the incredible range of results achieved by the correct implementation of FIR in all aspects of the sound reproduction signal chain. KS Digital FIRTEC DSP technology is the world's first and fully successful implementation of FIR (Finite Impulse Response) in an enclosure-driver-loudspeaker of a traditional design. The result of FIRTEC processing is: that it is possible to hear with clarity and accuracy as if one were listening to the original performance acoustically. Standardization of "flat frequency response," "positive phase response," and "precise center imaging," particularly for two or more speakers, is now the KS Audio "Sonic Truth" Standard. DSP	is "digital signal processing": a computer program that processes the input signal in the digital domain. FIR is "finite impulse response": a measurement process whose results are utilized by our DSP programs. FIRTEC is "finite impulse response technology" : a DSP controller program that integrates the measurement results to correct the audio signal so that the loudspeaker is able to duplicate the input signal for frequency and time (phase), without any discrepancies. The following is an explanation of the FIRTEC DSP technology. The graphs are made on the KS ADM 1 and ADM 2 (now ADM10 and ADM20) Studio Reference Monitors and are applicable to any KS Audio concert, PA or studio reference monitors fitted with the FIRTEC DSP technology. The above graph illustrates the results of FIRTEC DSP. The graph on the left illustrates a 22 microsecond (22/1000 second) full frequency impulse burst (all frequencies at the same volume). The additional motion that you observe after the termination of the impulse above and below the horizontal “0” line is not sound. It is unwanted noise from motion, phase anomalies, frequency alterations and distortion, all created by the erroneous, indifferent movements of the driver, beyond the original demand of duplicating the input signal. 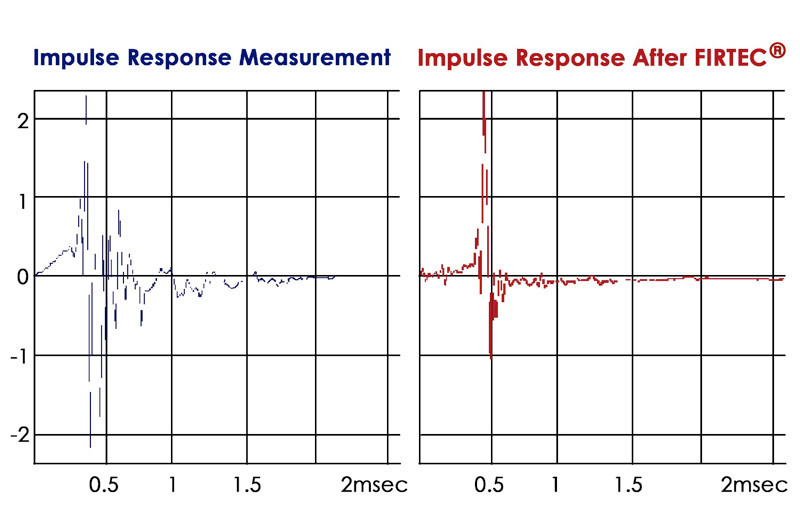 The graph on the right illustrates the same 22 microsecond impulse burst, with the FIRTEC DSP engaged. The comparison explains the vast improvement in the performance of the driver. And all corrections are performed in the time domain with a latency not greater than 5 milliseconds. Again, the graphic on the left represents the unaltered signal while the graphic on the right represents the same signal with the FIRTEC process engaged. THERE IS NO EQUALIZATION of any kind utilized in this report. The response you are looking at is the express result of Finite Impulse Response corrections performed exclusively in the digital time domain. FIR filtering also includes the crossover points, which are imperceptible when measured or audibly reproduced. It would be possible to use contemporary frequency equalization devices to make the graph on the left “look like” the graph on the right. However, for each added band of equalization there would be additional noise, distortions, frequency and phase shift anomalies (this is the problem with contemporary equalization-based DSP designs). When the FIRTEC process is engaged, these added circuit components are no longer needed, and reproduction is direct and accurate (thus representing the original signal entirely). The green colored graph on the left would be considered a normal phase response. 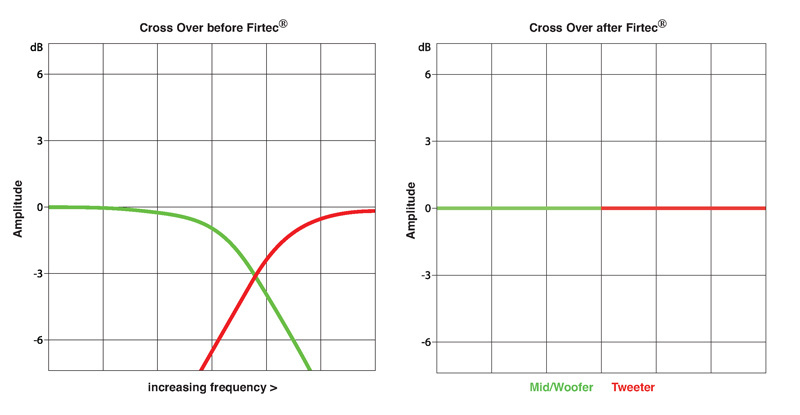 The red FIRTEC phase response graph on the right is considered a theoretical ideal and is thought impossible, yet KS Audio has been successfully achieving this result with FIRTEC DSP Technology since 1995. What you are looking at is a phenomena that goes beyond the limits of speaker and amplifier technology into a new realm of accuracy. Sounds have never been acoustically reproduced with anything approaching this level of accuracy. Prior to FIRTEC, absolute phase coherency could only be experienced in the presence of a live acoustic performance and without the assistance of any loudspeakers. Because FIRTEC removes the distortion and other anomalies introduced by the entire chain of electronics and hardware in a loudspeaker box, you can now, for the first time, easily detect any anomalies in the signal path that previously may have been totally hidden. In fact, since you are listening to an accurate representation of the input signal, you will realize there is little or no noticeable auditory fatigue in the listening experience. The first of the next two graphs shows a crossover point using analog filtering, illustrating a “trough” or dip in volume around the crossover point. In typical applications the loss in volume is noticeable especially in the vocal range, and is therefore misleading the engineer on critical equalization judgments. A two-, three-, or four-way analog filtering system will produce a non-linear output response curve over the entire frequency range of the system! The second graph shows our digital FIR filtering, which achieves no loss in volume. No loss in volume means the engineer is actually hearing the vocal performance as the microphone hears it, too--completely flat! Therefore, a KS two-, three-, or four-way system will achieve a fully linear output response curve over the whole frequency range of the system. Most manufacturers strive for a price point, compromising between price, specifications, and audio quality. Every manufacturer compromises in different ways. None of the driver manufacturers can offer a perfect driver, even regardless of cost. KS Audio has taken up the challenge of solving this dilemma by not accepting imperfect drivers. The acoustical results of speaker enclosures stem from many of these factors, thus KS Audio specifies our own designs exclusively. Continuous quality control of all components and close tolerances are an important part of the production process at the KS Audio factory. KS Audio uses only custom-designed drivers made to our exact specifications. Every driver undergoes individual testing by hand and must meet a strict set of very tight tolerances and quality control. In addition, every driver runs through a 24 hour burn-in process. All these procedures happen before the final FIR measurements are conducted in an anechoic chamber. To understand the importance of this expensive and time-consuming testing procedure, one has to know that to be within the accepted tolerances of most manufacturer's performance, driver output and response can vary up to 30%! Unfortunately, this means that even the same speakers from the same manufacturer, used together as a pair, can produce results of noticeably different performances. This is too broad of a difference to meet KS Audio's standards. The only way to deliver the best result is to have the controller, the amplifier, and the driver matched together in the hands of the same designers. They are at KS Audio. KS Audio FIRTEC DSP technology can be found in several studio reference monitors, self-powered PA speaker systems, and the digital FIRMOD 2 controller card (Modular FIRTEC DSP controller) for KS amplifiers when using un-powered or passive speaker boxes. All KS Audio products using the FIRTEC DSP process employ a 32-bit floating point DSP processor. Each of these products is equipped with analog and AES/EBU digital XLR inputs that accept any sampling rate up to 96Khz (variable up to 110kHz). Future A/D converter upgrades can be done economically by simply replacing the modular digital A/D converter board as new A/D sampling rate standards mature. At KS Audio, after each enclosure is manufactured, a FIR sample is taken and those impulse response results for that enclosure are programmed into its on-board FIRTEC DSP processor memory to correct the final response curve of this enclosure. The data is stored and identified with the serial number of the enclosure and logged into the KS Audio database for future reference. New enclosures for each model will sound fundamentally identical to all others of that model, no matter whether 1 or 10 or 100 are produced--there is no acoustical difference between them in performance. We utilize FIRTEC to achieve what was previously impossible in sound reproduction. The KS FIRTEC DSP program splits the signal into 240 segments and corrects the known performance anomalies of the enclosure prior to amplification. When a change is needed to be made, the system can be re-programmed to accommodate for the new response characteristics. FIRTEC DSP technology unveils a level of accuracy, transparency, and detail that can only be achieved by absolute phase linearity and with a linear frequency response of +/- 0.5db. FIRTEC DSP technology is exclusive to KS Audio and thus is unrivaled by any other speaker system on the market. Even professionals who hear FIRTEC controlled speakers for the first time are very often shocked by how natural, transparent, and precise the system sounds. FIRTEC loudspeakers do not have their own sound; they sound only like the input signal. For some people, this experience may at first be jarring, because they are not accustomed to the loudspeaker itself having no auditory impact or coloration in the role of sound reproduction. Engineers who work with FIRTEC technology realize very quickly that by eliminating the inappropriate behaviors of the speaker system, their work is made even more efficient while removing all the guesswork from the mix. As the engineer does not have to fight against conventional speaker design aberrations, they can truly create their own sound like never before! The next set of graphs shows the combined impulse response readings from 5 enclosures, overlaid upon each other to visually describe how the differences to each other are negligible. Color denotes the individual enclosures and to confirm their deviations from each other. 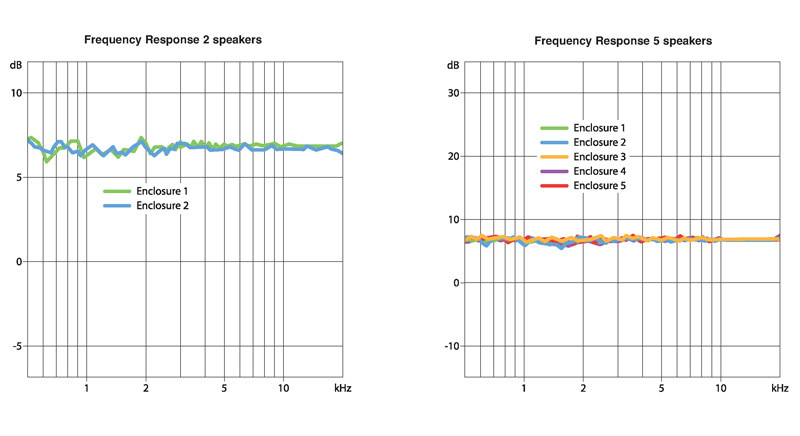 The first graph with two colors illustrates a pair of impulse response readings of only two enclosures in stereo, and again, they visually describe the differences between each other. The result is remarkable in as much as that those differences are seen here but never heard, and for the first time, accurate stereo imaging, especially the signals in the center, are fully defined anywhere within the image and between the speakers. The net result of manufacturing enclosures using FIR measurements and FIRTEC DSP is that every speaker sounds absolutely identical to each other. Multiple systems can be easily updated with new enclosures. For surround sound systems, this process permits each speaker to share the same reference as the other speakers when additional speakers are ordered at a later time. Upon leaving the factory, a pair of speakers are certified as fully flat and uncolored by this KS Audio technology. A vast majority of studios have control rooms that are not as acoustically flat as one would like. When a pair of KS Audio speakers or a 5.1 surround system is positioned in such an uneven room, one can make new measurements from the listening position and email those results to KS Audio. As KS Audio had stored the serial number along with the original program, KS Audio merges the additional measurement data and emails the new program back to the studio. This is KS Innovation at work. The FIRTEC process, as described earlier, eliminates a variety of distortions produced by the loudspeaker system. It is the opinion of the KS Audio engineers that ear fatigue is primarily caused by such distortions, at reasonable listening levels. As a consequence, every engineer working with KS FIRTEC technology will not experience the primary cause of ear fatigue; and, the engineer will detect details that were previously undetectable, reducing the need for rest periods. For the first time in audio history, FIRTEC provides the mix engineer with the certainty that they can trust all that they are doing. This finally results in a true standard in audio reproduction technology for the recording studio environment, and it sets a new standard in sound reproduction technology. One of the hallmarks of KS Audio PA systems is that the lower frequencies intentionally maintain a level of presence and balance even at lower volumes. Select KS Audio self-powered products have FIRTEC DSP technology built-in. For all un-powered KS speaker systems, the FIRTEC DSP controller card, called FIRMOD, is front loaded into a slot on KS Audio TA 4U amplifiers. This provides for analog or digital AES/EBU inputs directly into the amplifier. KS Audio has 3 ordering options available for FIRTEC in PA systems. 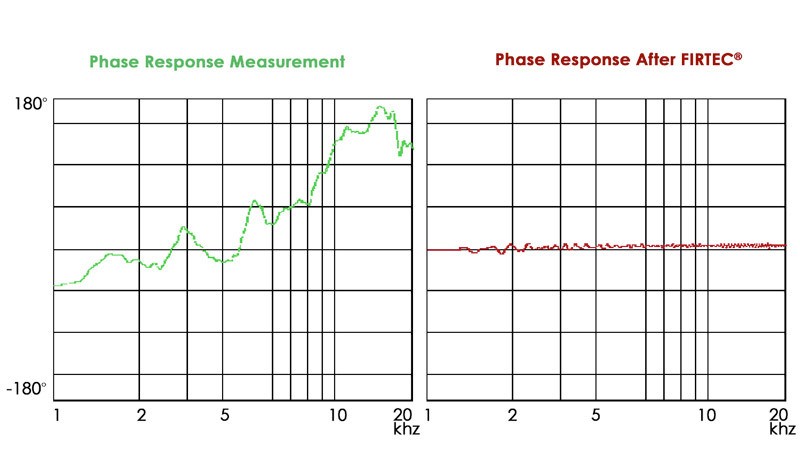 KS Audio makes the FIR measurement of a batch of drivers and downloads the averaged-out result into each DSP. As a special request, KS Audio makes individual FIR measurements of each speaker box and downloads these measurements into the DSP for each of these speaker boxes or FIRMOD controller cards for the amplifiers. Consequently, the customer receives the speaker box or the FIRMOD controller card with the FIRTEC DSP controller, matched by serial number, as described above in the studio section. It is possible to upgrade from option 1 to option 2 in the field. Where an absolute high standard is of primary concern, a KS Audio technician will travel to a venue or installation to make a new set of FIR measurements and update the FIRTEC DSP program to match the acoustics of the room, and can include refinements by the house audio engineer. KS Audio has done this in numerous opera houses, the German Parliament building, and many other venues. KS Audio Live PA Loudspeakers and KS Digital Studio Speakers achieve The Sonic Truth.